The natural areas of more than half of the state of South Carolina have been recognized as part of a globally significant natural landscape. The North American Coastal Plain has been designated as the "World's 36th Biodiversity Hotspot" by the Critical Ecosystem Partnership Fund. The coastal plain of South Carolina includes the Sandhills region and all the land between it and the ocean. The South Carolina Sandhills area runs from just below North Augusta through Aiken, Columbia, Camden and Cheraw. For more information on the World's 36th Diversity Hotspot, see: www.cepf.net/news/top_stories/Pages/Announcing-the-Worlds-36th-Biodiversity-Hotspot.aspx. The Critical Ecosystem Partnership Fund is a nonprofit group whose mission is "Protecting Nature's Hotspots for People and Prosperity." Dr. Reed Noss, Provost's Distinguished Research Professor at the University of Central Florida and author of the landmark book "Forgotten Grasslands of the South: Natural History and Conservation," who wrote the report, said the Palmetto State's Coastal Plain region is a favorite of his. "When I visited South Carolina as I was researching my book, I was struck by the diversity of natural community types within the state, not only in the Coastal Plain, but in the Piedmont and elsewhere," Noss said. "South Carolina Department of Natural Resources lands, such as Woods Bay State Park Heritage Preserve, are especially interesting to me. I make a point to stop and walk around at Woods Bay every time I drive through the area on I-95." 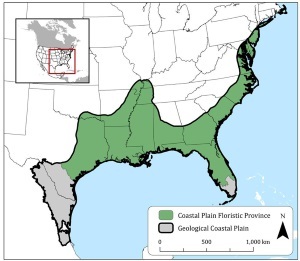 The South Carolina Coastal Plain's natural wonders have long been documented and publicized by researchers and educators (from early scientific explorers like Bartram, Lawson, Catesby, Michaux and others beginning in the early 1700s, to contemporary naturalists like Rudy Mancke and Patrick McMillan) and appreciated by South Carolina citizens and others. This worldwide recognition is phenomenal in many ways, including the fact that it will generate more grant money for research and more dollars from ecotourism; publicize and generate support for S.C. Department of Natural Resources (DNR) land acquisition, prescribed fire and other active land management; and serve as a point-of-pride for all South Carolinians. A 2009 study by the University of South Carolina showed that the state's natural resources generate $30 billion dollars a year. According to DNR biologist Johnny Stowe, much of that revenue comes from ecotourism, from people coming to enjoy the natural wonders of the state's coastal plain. The state's citizens as well as people from many other places visit the DNR's Wildlife Management Areas and Heritage Preserves to hunt, fish, hike and take photographs. Researchers, authors and educators also take advantage of these unique lands to discover and share information about the natural world. Stowe says, "It is great for people from around the world to recognize how special South Carolina is. Children learn in school about the biodiversity of the tropical rain forests of Brazil, but often don't realize they have something just as special right down the road, often right in their backyards. We are very fortunate to have Dr. Noss, one of the world's top conservation scientists and advocates, take such a keen interest in our state. 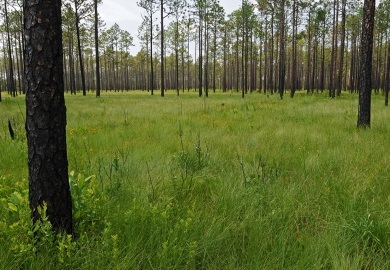 His grasslands book, as well as 'Saving Nature's Legacy,' a book he co-authored, are key parts of the foundation of land protection and management in the Southeastern United States."